There are few individuals in the self-help industry who possess career accolades equivalent to those of Tony Robbins. Although Robbins came from the humblest of upbringings, and never received a college education, he has been able to amass a fortune by helping millions of people move their lives forward. Today, many of his teachings on topics such as motivation, personal achievement, and financial freedom are considered to be the self-help gold standard. By persistently mastering the intricacies of life, Robbins serves as a living example of someone ‘who lives what they teach, who walks their talk’. One of the commonalities shared amongst many of the world’s most influential self-help leaders is that they used a precarious upbringing as motivation to change their own lives and eventually the lives of countless others. Tony Robbins, being one of these individuals, used the pain from an unstable family environment as the fuel that propelled him to becoming one of the industry’s foremost leaders. After being born on February 29th, 1960, and given the birth name Anthony J. Mahavoric, Robbins dealt with his first significant childhood hardship, at the age seven, when his father, who was unable to provide for the family, left him, his two siblings, and their mother for good. When Tony was 12-years-old, he and his siblings were adopted by his mother’s new husband Jim Robbins, who was a former semiprofessional baseball player, and the children took on the Robbins family name. Unfortunately, Tony’s stepfather also struggled to make ends meet and provide for the family. It is said that the family’s financial circumstances were so dire that they often couldn’t afford to celebrate Thanksgiving or Christmas. Moreover, because his parents struggled with addiction, Tony was often tasked with caring for his two younger siblings. 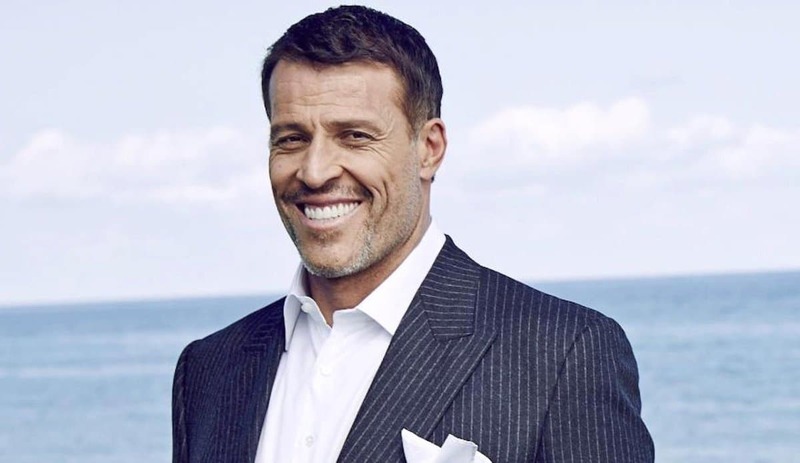 Although Tony Robbins never attended college, he began showing his motivational prowess during his years at Glendora High School in Southern California, and as a senior, Robbins was elected as student body president. Yet it was also around this time when Robbins faced another set of trying circumstances. At the age of 17, after his mother chased him out of their house with a knife, Robbins made the decision to leave the toxic environment forever and instead focus on shaping his own destiny. After working for sometime as a janitor, Robbins took a job promoting seminars for Jim Rohn, a self-help legend in his own right, and he would soon see this line of work as his true calling. Although Robbins didn’t have an educational background in psychology, he was able to first make a name for himself while working as a self-help coach. In the initial stages of his career, Robbins taught a type of psychotherapy called Neuro-Linguistic Programming (NLP) which is learned while training under one of the creators of NLP, John Grinder. It was in 1983 when Tony Robbins began incorporating the fear-busting strategy of fire-walking into his seminars, and since then, the exercise has become closely associated with his teachings. Robbins took his reputation to another level in the late 80s and busted onto the national self-help scene in the biggest possible way. In 1986, at only the age of 26, Robbins published Unlimited Power which quickly rose the charts to become a national best seller. Two years later, Robbins launched his first ever infomercial, Personal Power, and by 1991 it was estimated that over 100 million Americans had watched Robbins on TV. In addition to Unlimited Power, Tony Robbins has also written three other national best sellers. In 1991, Robbins released the highly acclaimed Awaken the Giant Within. In 2014, Robbins published Money: Master the Game. And earlier this year, Robbins released his newest book Unshakable: Your Guide to Financial Freedom which just recently became a New York Times Bestseller. For Robbins last two titles, Money: Master the Game and Unshakable: Your Guide to Financial Freedom, the self-help icon vowed to give all of the books’ proceeds to the non-profit organization Feeding America. Not only has Tony Robbins inspired the masses with his books, but he regularly hosts workshops throughout the world where individuals can work with him personally. Additionally, Robbins is a regular guest on Oprah Winfrey’s OWN network, is the chairman of Tony Robbins Holdings Inc., an umbrella organization comprised of more than a dozen privately owned companies, and is a regularly speaks on some of the world’s most prestigious educational speaking circuits. Since Robbins busted onto the national self-help scene in the 1980s, he has personally coached some of society’s most illustrious individuals. He has been honored by the likes of Harvard Business Press and American Express as part of their lists for ‘Top 50 Business Gurus’ and ‘Top Six Business Leaders in the World’ respectively. While Tony Robbins professional accolades speak for themselves, what may be most impressive about the man who came from the humblest of upbringings is his philanthropic efforts. According to his website, Robbins feeds four million people each year in 56 different countries. He has initiated programs in thousands of schools, prisons, and service organizations, and provides fresh water to 100,000 people in India each year. It is certain that based upon his body of work, Tony Robbins is a once in a century self-help leader who continues to inspire the world today. Another one of Tony Robbins’ most important teachings is on the topic of decision-making. While asking ourselves the right kind of questions can enlighten us with answers to some of our most pressing question, our destiny will forever be determined by the decision we make. Robbins’ own life is a great example that shows how an individual can consciously decide to overcome the set of circumstances they were dealt by making the decision to do so. In particular, Robbins tells us there are a number of decisions we are continuously making, and only by consciously choosing what we focus our attention on, deciding what various life experiences mean to us, and determining the ways we can move our lives forwards, will we be able to reach our fullest potential. “It is in your moments of decision that your destiny is shaped,” Robbins tells us.